This morning I'd like to introduce you to a talented local photographer, Cody Buell; although, it's likely many of you have already met his acquaintance over at the deeply-missed local blog, Your Heart Out, where he and his wife Courtney were contributors. You can tell from these lovely images that Cody is not only an excellent wedding photographer, but a fantastic food photographer as well. Talk about mulit-faceted! You can view Cody's portfolio + well-designed website here. Yes, great images. I can't stop looking at those fabulous blue shoes. They steal the show! Wow! Cody Buell has a gift for capturing that perfect moment! Thanks for sharing his beautiful photographs - love his blog too (the black & white Utah State Cap Building is breathtaking)! i love his work. great sponsor! 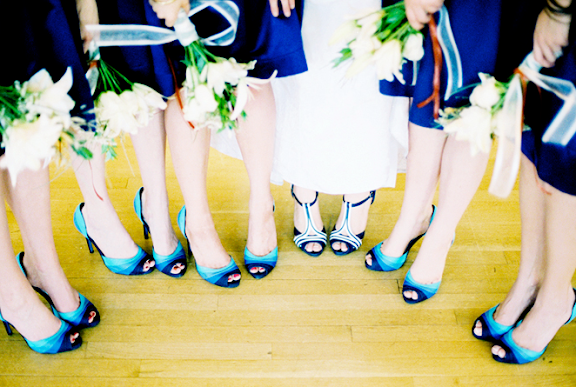 I'd love to meet the super cool bride who picked those shoes for her gals too.